Well I have not blogged in awhile because I have been busy with work and getting dentist work done. It's so funny how you can have no children and allow God to open your heart to a child and then that's all you can think about. 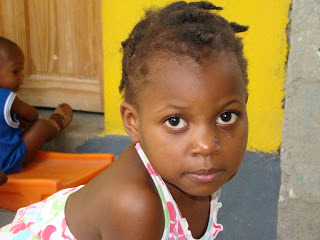 In the dentist chair yesterday I was thinking about Naitile and how much love God has placed in me for her. (By the way I had 4 1/2 hours to sit in a dentist chair so I had time to think.) Now I know there are some people out there that would say that love just comes natural to them and that is ok. But I know that love comes from God alone and the ability to love comes as a precious gift to us. We then have a choice if we will accept the gift of love. It says in the Bible "that every good thing comes from God". For me loving Naitile is a good gift that comes from God. Don't we serve a great God! I am just like every other parent that is adopting.....I want my child home now but I was able to take a moment and just thank God for now. My life has already been changed and my heart has to be two sizes bigger. And God through Naitile has already changed lives here and is not here yet. She has made people think about how they love or don't love, she has made people want to know more about Haiti, and she has opened some eyes to see things that they did not know existed. Wow don't we serve a big God that is using our children before they are even here. I had to ask God to forgive me in being so caught up into if and when my child is coming home that I could not see all the wonderful things that He is doing through my child already. Besides He is the one that gave me the ability to love and now I am going to try to tell Him if or when? I don't even pretend to know what you are facing today. But I do know that God is big enough. We can only love because God first loved us. Take time today to embrace His love. Take time to embrace what He is doing right now and ask Him to open your eyes to what He is doing that we are not seeing. That we may be able to embrace the good things of God now and stop pushing for the future before we are willing to see His goodness.!! Wow I just love God!!! Your mama side is pretty darn awesome! Thanks for sharing. I cannot wait for you too to be reunited with your baby girl! Call me sometime, we'll have to get together and hang out. OK, really love reading your blog, can we get another one going?